For those expecting Joe Biden to deliver a political stump speech — or a taste of his future plans — during a visit to Burlington on Sunday, he failed to deliver. The former vice president and senator avoided all but an ambiguous hint when it came to discussing a possible 2020 presidential run, and he steered clear of any direct attacks on President Donald Trump — even as he came to the home turf of Sen. Bernie Sanders (I-Vt.), a possible 2020 competitor. Instead the 76-year-old appeared intent on offering a more personal message. For those who are grieving or bereaved, he told a packed house at the Flynn Center for the Performing Arts, "There's a reason for hope, believe it or not." Biden, appearing at ease on stage, offered frank advice about coping with grief. He's familiar with it; his first wife and daughter died in a car accident in 1972. "Purpose is what saves you" from being consumed by loss, he said. The former VP detailed the balancing act of caring for his dying son while still serving in the nation's No. 2 position — and the way it influenced his decision not to run for president in 2016. “I thought I was best equipped to finish the job Barack [Obama] and I had started," he acknowledged. Beau Biden forbade his father from publicly revealing the severity of his condition, even when he had just months to live. So the elder Biden kept mum about his need to prioritize care for his son, even as his staff prepared for a run for the White House. Joe Biden publicly declared that he would not enter the race in September 2015. But his eldest son's words kept Biden engaged on the national political stage. Four months before Beau Biden died, he asked his father to vow “on his word as a Biden” that he would not withdraw from politics in the coming years. 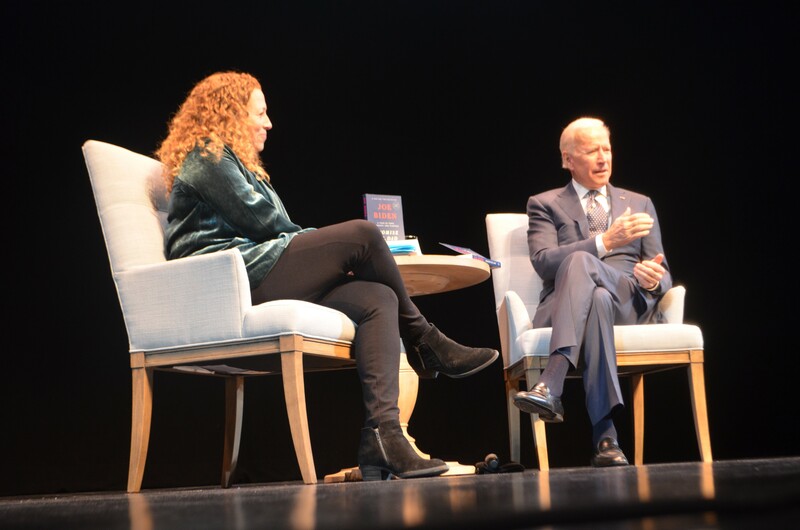 At one point, after Picoult asked how the former VP wanted to spend the rest of his life, a member of audience called out, "2020!" and the crowd broke into cheers. But Biden offered no more reassurance for supporters than to say, "I gave my word I'd stay engaged" in political life. At least some audience members were content to hear the statesman's take on matters besides the next election. "I'd like to hear some sanity," said Burlington resident Ann Irwin, adding that she'd prefer someone "less white male" on the ballot for president. "He's so positive," said Lynn Espey of Stowe. And, true to form, Biden remained genuine and self-deprecating. He paused before critiquing what he called "phony populism" and nationalism in the American and international political scene: "Bless me, Father, I'm about to sin," he said. Biden praised Vermont and described placing an offer on a house in Rutland after his first wife died. He ultimately decided to remain in Delaware with his family, he said. And he discussed his five grandchildren, whom he texts or calls every day. After all, no matter his ambitions, Biden said, "the beginning, middle and end is family."